Where is the district office located? Will I ever get my deposit back? Do you ever estimate usage? What is Current Outdoor Watering Schedule? Who needs a Plumbing Permit? How do I locate my water shutoff valve in an emergency? Where does my responsibility begin for operation and maintenance of the water line and wastewater line for my home? Is there any adjustment (credit) given if I have a leak? What is a defined area? What are the wastewater rates? What are the fines for not following the mandatory watering schedule? Whom do I call if I have a water leak or sewer problems? Can I look at documents myself? Where can I read the District’s Boat Docks and Marinas policy? A Water Control and Improvement District (WCID) is a political subdivision of the State of Texas, and is empowered to purchase, construct, operate, and maintain everything necessary to provide water, wastewater and drainage services. Like school districts and fire districts, a WCID can collect taxes, charge service fees, operate facilities, own land, condemn property, and pass ordinances. A five (5) member Board of Directors is elected by the residents to serve four (4) year staggered terms. Elections are held every two years on the first Saturday in May. 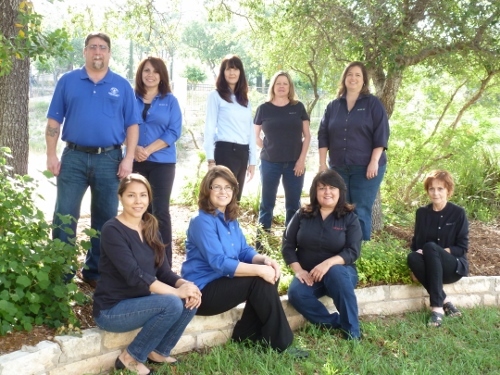 District 17 is a non-profit public utility regulated by the Texas Commission on Environmental Quality (TCEQ). New customers may come by the District office at 3812 Eck Lane, Monday through Friday, anytime between 8:00 am and 5:00 pm to fill out a Service Agreement and pay the necessary fees to establish service. Or, customers may call Bree Benner at (512) 266-1111, extension 123 to pay by credit card. A refundable deposit, which is based on the meter size, and a non-refundable administration fee of $25.00 must be paid to establish service. The deposit will be automatically refunded to the customer’s account after twelve (12) consecutive months with no late payments, or when the account is closed after the final bill has been deducted from the deposit on account. The Service Agreement can also be found on the website under the Forms tab. Residential deposits are returned after a Good Payment History (GPH) has been established. This is defined as 12 consecutive months of payments with no late charges and no NSF checks. The deposit is then credited against your utility bill. If a GPH is never established, the deposit is credited against the final bill when the account is disconnected. Commercial deposits stay on account until the account is closed, at which time the deposit is credited against the final bill. Meters are usually read from the 13th to the 15th of the month, and bills are mailed around the 25th. The water bills are generally due on or before the 10th of the month. The bills are due by 5:00 pm on the due date, which may vary slightly each month, so please take note of the due date as soon as you receive your statement. A penalty of 10% is assessed when the account is not paid in full by the due date. An account becomes delinquent when it is two months past due and a 10-day delinquent notice is sent out. If payment is not made by the due date on the delinquent notice, the water will be turned off and a $35.00 reconnect charge will be assessed. It is against the rules and regulations to turn your water back on yourself after being disconnected for non-payment of your bill. No. Utility billing dates and due dates are set and cannot be changed. But, there are things you can do to help you get your bill paid on time. See How do I Pay My Bill? below. Payment may be mailed to 3812 Eck Lane, Austin, TX 78734; dropped-off in the lock box located in the driveway of the District office, made in person at the District office; over the phone by credit card (Visa or MasterCard); or by FREE automatic withdrawal from your checking or savings account. To have your monthly bill deducted from your checking or savings account, please use the green “Pay Online” button on the bottom of the Home page to set recurring payments up. Please allow at least ten (10) business days for this request to be processed. There is no additional charge for this monthly service and it may be cancelled at any time. A meter reader reads each meter every month. Meters read by radio are checked by hand periodically to ensure accuracy. The only time we estimate usage is when a customer requests it for a leak adjustment or when a meter has been tampered with or damaged. If you have abnormally high usage as a result of a water leak, you may apply for an Unintentional Water Loss Adjustment. You will need to submit your request in writing, providing the date when you think the leak may have started, the cause of the leak, and the date the leak was repaired. You will also need to attach a copy of the repair invoice or receipts for materials used to repair the leak. You may mail this request in, drop it off at the District office, fax it to (512) 266-2790, or email it to lvickery@wcid17.org. The Board of Directors meets every month on the third Thursday at 6:00 pm at the District office at 3812 Eck Lane. There is always a posting for public comment at 6:30 pm, and everyone is welcome. The agenda is posted each month in a glass case outside the District 17 offices on Eck Lane, and on the website under Agendas and Minutes. *Defined area residents also pay the District-wide tax; $0.0599. A defined area is a specified area, usually (but not always) an undeveloped area, within the District which has been identified as needing water and/or wastewater service. Defined areas can only be established by a general election vote by both District 17 residents and defined area residents. Once the defined area is established, utilities are installed either by a developer who pays the costs or by the District using loan money. Utility installations are inspected by the District and Texas Commission on Environmental Quality (TCEQ) personnel. The TCEQ monitors and approves every step in the bond issuance process, and must approve every issue made by the Board. When the TCEQ has approved the utilities, and enough development has occurred in the area to establish a tax rate, (usually this process takes several years) the District issues bonds and uses the money to purchase the installed utilities from the developer or to pay off loans taken out for the purpose of installing the utilities. Residents of the defined areas pay a special defined area tax in addition to the District-wide tax to pay off the bonds. An LUE or Living Unit Equivalent is a planning tool which is a measure of the typical flow of water used or wastewater produced by a single family residence. For water, this includes consumptive uses such as lawn watering. The wastewater system does not receive these flows, so the figures for water and wastewater are different. A typical dry weather water usage for 1 LUE would be 350-500 gallons per day. The smallest meter, 5/8-inch, is sufficient for 1 LUE, the next size up, ¾- inch meter is 1.5 LUEs, and the next size, 1-inch meter would be large enough for 2.5 LUEs. See the Rates and Fees section for a complete list of meter sizes. A very large estate home with five bathrooms, for example, might need a 1-inch meter or 2.5 LUEs of service. Wastewater design planning criteria is 250 gallons per day per LUE. An Impact Fee, also called a capital recovery fee, is a one time fee assessed to pay for the cost of central facilities such as water or wastewater treatment plants, tanks, pump and lift stations, ponds and buildings. Impact Fees are usually calculated by estimating the capital costs of all central facilities required for an area and dividing by the number of living unit equivalents which will be served by the facilities. When Impact Fees are paid, service is guaranteed, and the service is assigned to a particular property. There are separate impact fees for water and wastewater which may change periodically as District development progresses, land use changes, or construction costs go up. Impact Fees are paid per LUE by new development or connection of existing homes which have never had water or wastewater service from the District. The use of Impact Fees to finance new facilities allows the District-wide tax rate to remain very low, because new development pays for itself. Please use Rates and Fees page to view the entire rate sheet. The Rates and Fees page overrides the fees listed here. Base rate is based on the meter size. Base fee for a 3/4 ” meter is $20.00. Please use Rates and Fees page to view the entire rate sheet. The Rates and Fees page overrides any fees listed here. Residential wastewater rates are based on the average of the water usage from mid-November through mid-February billing periods because those are the typical months with the least water usage and the months when outdoor watering is often shut off. Customers with no usage history will be assigned a 8,000 gallon usage rate until a winter rate can be established. Water in this area is classified as hard. Hardness is measured in calcium carbonate (CaCO3) equivalents in milligrams/liter and is an indicator of the amount of calcium, magnesium, and other ions in the water. Hardness readings range from 154-239 mg/l which converts to 8.99-14 grains per gallon. The average is about 190 mg/l or 11.1 grains per gallon. To convert milligrams to grains per gallon, multiply hardness in mg/l X 0.0584. Go to water quality and water quality report for other water quality information. During working hours, call the District office at 512-266-1111 Ext 122. After hours, call the emergency phone number; 512-537-8302. Call Water District 17 first before calling a plumber unless you are sure the problem is in your house or on your property. We will investigate the problem, and if it is on our side, we will repair it. CALL US FIRST, WE ARE HERE TO HELP. The request doesn’t have to be in any special format or cite any statutes. A request may be handwritten or typed, and must have enough information to identify the information requested, and enough information for us to respond to the requestor (i.e., name, address, telephone number, e-mail). An open records request must be for information in existence at the time of the request. Information will be provided within 10 business days. Yes. You may come into the office at 3812 Eck Lane anytime during working hours to view documents, talk with staff if they are available, or examine maps, construction or site plans. You may get copies right then if a document is readily available, or request copies to be picked up later. Appointments are always appreciated.